It is the start of our workshop. Begin. Eyes closed - 2 minutes of quiet deep breathing. Gabriel, who we have affectionately called Gabe since we met, launches us into the universe of choral singing. 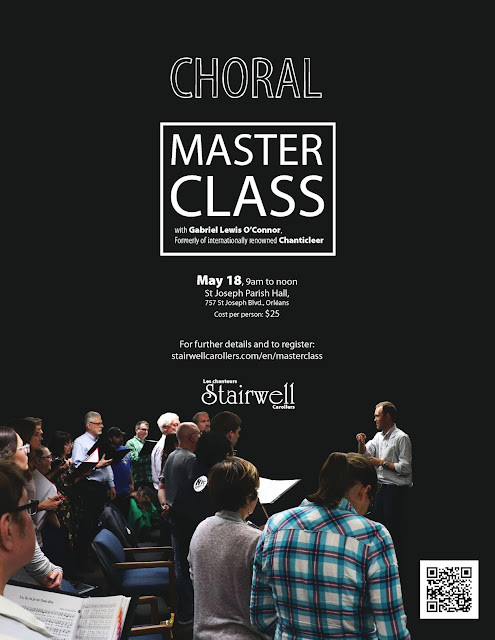 Formerly of the group Chanticleer, Gabriel Lewis O'Connor traveled from his home in Seattle to do workshops with the Stairwell Carollers. For two days, we would be his instrument. He would improve what he could in our voices. Crescendo. Decrescendo. Sotto voce. Fortissimo. Without being a "Stradivarius", we offered him a chorus well prepared by our maestro. Pierre Massie had high expectations. The prepared songs for the upcoming concert were, as best we could manage, note perfect. Gabe could now refine the performance and suggest new interpretation - which he did with humour and respect. We were charmed like children and responded readily to his new ideas. For El Grillo, he suggested a nasal voice common in the Medieval era. For the song Ach, wei de Leiden, he insisted on the importance of understanding the words; Schmerzen (pain) must be interpreted expressing the sorrow of love. "If you leave me, I die" - It comes back to that. This is one of the songs we would sing at the concert, sharing the evening's program with two of the best of Glebe Collegiate's choirs, directed by Rachel Handley. Saturday afternoon, these young singers joined us and we continued the workshop with them. At the concert, my vocal ensemble performed five songs. Then, it was the turn of the students and finally, the two melded groups interpreted the grand finale. The highlight of the evening: a Gabriel solo. O Hostias followed by O Domine from Fauré's Requiem. When all took their places, we would have heard the ticking of a clock as the audience was so focused. No chorister was at the end of their ropes despite the long rehearsals; neither young nor old. A little explanation is needed. Fauré's Requiem requires an orchestra. No problem. Pierre had prepared an accompaniment, a harmonization learned with great effort, but what motivation to sing with an ex-Chanticleer! ( This group of twelve internationally renowned American singers will charm Ottawa in July at the Music and Other World Festival. )Gabe was part of Chanticleer for four years and participated in five hundred concerts around the world! In short, this last weekend has transported me to 7th heaven. A blue cloudless sky- and this was literally true. The location, Galilee in Arnprior, a former Oblate convent, is set amidst lush nature adjoining the Ottawa River and we enjoyed wonderful weather all weekend.Personally, I clicked with Gabriel Lewis O'Connor and vice versa. He saw my passion for singing. "I love your smile" he told me during the first rehearsal. I was so stunned that I checked with him if he had spoken to me and not to Maggie right behind me. She always sings with wonderful expression. No, it was me he was speaking to. It made me blush, I must admit. All of us now have wonderful memories of the hours spent together as a group.Gabriel enjoyed his experience so much that he wants to visit with his family and perhaps even live there when he finishes his doctorate. Cliquez ici pour la version Francais.